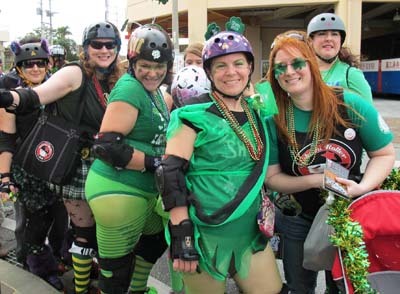 The St. Patrick’s Day parade along Chuo Park Avenue takes place on Saturday. 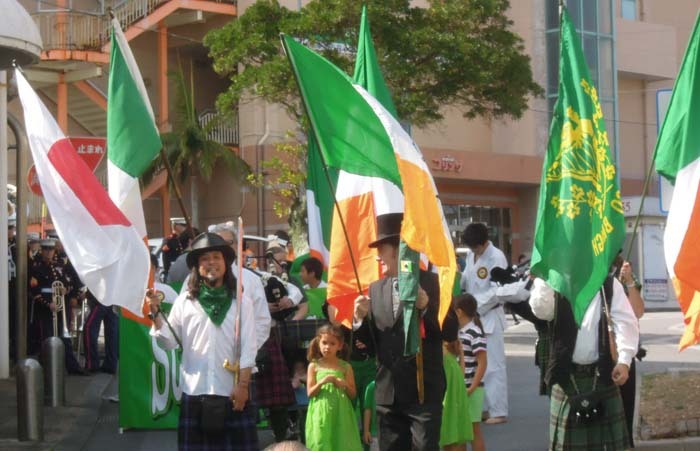 Although the ranks of the Irish may not be so large on Okinawa per se, there’s no lack of people who are Irish in their mind. 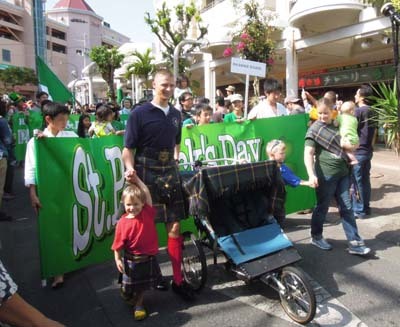 Or at least, are very much so in spirit this Saturday, when the 10th St. Patrick’s Day Parade takes place starting at 15:00 from Korinza progressing along Chuo Park Avenue. 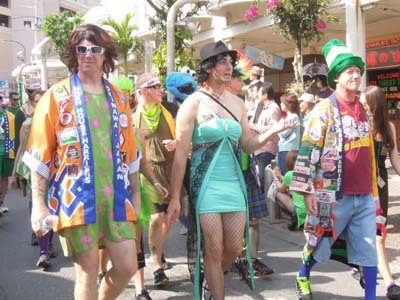 The parade attracts more and more people every year. Everyone is invited to participate and have on something in green that’s the Irish national color. According to the event organizers, the best place to purchase goods related to the St. Patrick’s Day is the Daiso 100-yen shop. Japanese Ground Self Defense Force, JGSDF, Brigade Band leads the parade, while groups like Kokeshi Roller Dolls, a Roller Derby team that is scheduled to compete in the Japan Open Roller Derby Tournament 2016 at Okinawa Prefectural Comprehensive Park on March 25th and 26th, Hawaiian Hula Studio ‘Mahalo’, and Okinawa City official mascots ‘Ei-bo’ and ‘Sa-chan’ are also expected to participate. Following the parade, the 18th Kanaderu Park music event takes place with live bands performing on several stages set along the Park Avenue. Several food and drink vendors, including the popular pizza-catering car, The Scarpetters, will provide food for the bodies while people’s souls enjoy the music. Admission to both the parade and the Kanaderu Park music event is free. The music event is scheduled to wrap up at 20:00. The Kanaderu Park programs begin at 4 p.m., following the parade. During the events, the avenue will be closed to vehicles between 12:00 and 20:00. People can also have a taste of St. Patrick’s Day and Irish music tonight on the 3dr floor stage at AEON Rycom where Irish Achan is set to perform from 13:30 to14:00 and Nina from 18:00 to 18:30. On the same day in the evening, both performers plus Tommy will kick it up at The Smuggler’s Irish Pub in Naha starting 21:00 and 22:00.